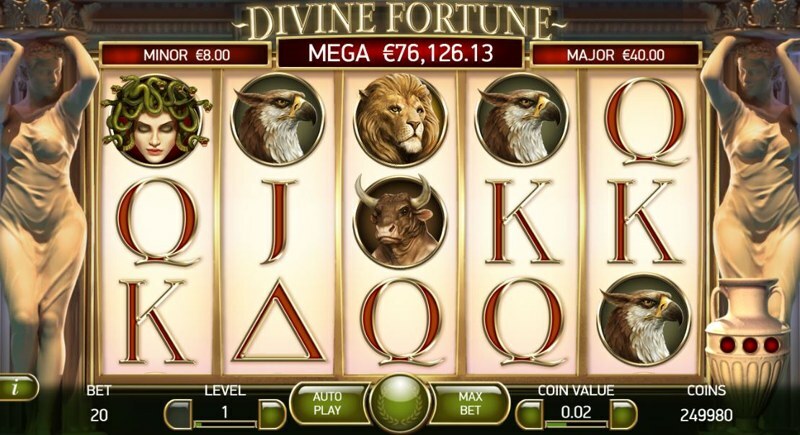 Divine Fortune is Net Entertainment’s most recent slot release, and – already offered in almost every Net Entertainment casino – it’s quickly become a popular hit with players, largely thanks to it’s Mega Jackpot, and exciting gameplay. The game itself is based around an Ancient Civilisation, and you’ll see a fantastic display of graphical work as soon as you open the game up. Each side of the reels are 3D, High-definition statues, that look very realistic, and the Roman-like theme is projected onto the reels, with a variety of symbols taking their place, including the lower-paying playing card symbols, including 10, Jack, Queen, King, and Ace, and the high-paying symbols, which includes a Lion, a Bull, an Eagle, a Woman with Serpents as Hair, and a Horse, which acts as a wild symbol. 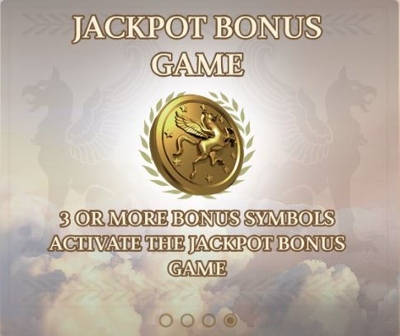 There’s also a scatter symbol, and a Gold coin, the latter which triggers entry to the progressive jackpot bonus-round. The Falling Wilds Re-Spin feature is found in both the base-game and the free-spins bonus, and while it’s similar, we’ll first cover what happens when it’s triggered in the base-game. 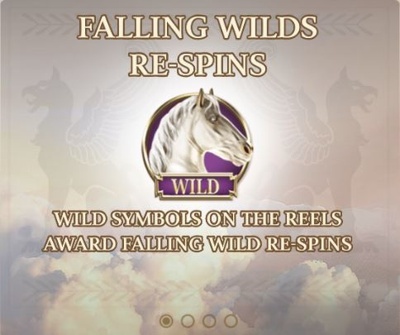 Each time you land a wild symbol on the reels, you will receive a free re-spin, with the wild moving down one place. So, for example, if you landed the wild on the bottom row, you’d get one free re-spin – land it on the top row however, and you’d get three re-spins, as the wild moves down a row. Land more wilds, and this continues, so it can get quite profitable, especially for a base-game feature. 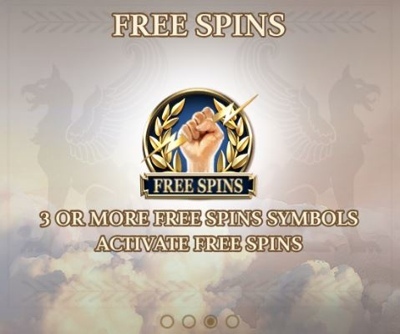 The main free-spins bonus is triggered by landing three or more of the scatter symbols anywhere in view. Three scatter symbols awards 5 free-spins, while four and five award 8 and 12 respectively. Now five free-spins may seem like a fairly low number, but the way the free-spins play out help dictate why it’s lower than most Net Entertainment games. Like in the base-game when you land a wild symbol on the reels, during the free-spins, you’ll receive a re-spin when you manage to land a wild, however, when you do land a wild symbol, it expands to cover the entire reel, before then moving down one row at a time. Of course, if you manage to land a wild symbol on reels 1 and 2, 1 and 3, or 2 and 3 you’re in for at least three spins with guaranteed wins, and hit a wild (or matching symbols) on reels 4 or 5, and you’re in for a huge payday. While you can’t re-trigger the bonus, it can get big fast, so there’s plenty of opportunity here. On the left-hand-side of the screen you’ll see a vase – this has three dials on it, and you need to fill these dials to enter the Jackpot Bonus Game. During regular base-game play, this requires you to land three or more gold coins on the reels, but during the free-spins round, this tally adds up, so it’s a lot easier to enter the progressive jackpot round through the free-spins than it is the base-game. Once you manage to trigger the Jackpot Bonus Game, you’ll then be taken to a separate set of reels. The only symbols on the reels now, are gold coins, and blank spaces. You need to land a line of gold coins (5-of-a-kind) to scoop the jackpots. You’ll begin with three gold coins stuck in place, and each time you land another, you’ll be awarded a free re-spin, so it’s tense, exciting, and – if you manage to land the Major Jackpot – very profitable.